Jim Heavey has been a woodworker for over 40 years. After some on the job training on his own home and with master craftsmen, he started a small remodeling business which included furniture and cabinet repair. In 1993, he and his brothers formed THE DEMO TEAM. Their purpose was to provide tool and accessory companies with professional demonstrators for National Woodworking and Hardware Shows. Jim’s work with THE DEMO TEAM lead to his becoming a consultant and prototype tool evaluator for Bosch Tools and to his current commitment with WOOD Magazine. As a contributing craftsman and educator for WOOD Magazine since 1996, Jim has had projects and articles featured in the magazine and has designed and presented educational programs nationally for woodworkers through Sears, Rigid Tool and The Woodworking Shows. He has also provided educational programs and videos for companies that supply products to woodworkers. In his role as educator, Jim strives to make woodworking fun for both novice and seasoned woodworkers by teaching techniques and providing information that will help them to produce a quality project at any level of expertise. Jim has served as a technical consultant for both ad campaigns and television commercials and he was the spokesman for WOOD Magazine in a television commercial that aired in the Fall of 2003. 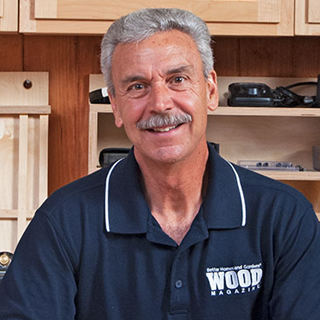 He currently represents WOOD Magazine as a spokesman and presenter at The Woodworking Shows as well as an educator at WOOD Magazine's Weekend With WOOD. Jim is also an instructor for Craftsy, an online educational provider. Jim has taught both individual and group woodworking classes in his shop in Northern Illinois where he also produces furniture for his family. Through his work with 4-H, Jim enjoys giving back to the community while mentoring future woodworkers.